The Researchers behind Focus Fast® were motivated to develop an all-new formula to Improve Memory, Increase Focus, and Enhance Attention. 39 powerful ingredients have been selected for their quality, potency and efficacy. Focus Fast® is the pinnacle in brain supplementation and mental support. In Addition: For maximum support, take 1 additional serving (2 tablets) with an 8 oz. glass of water approximately 30 minutes before lunch or mental activity, with a minimum of 4 hours apart from your first serving. Warning: Not to be used by individuals under the age of 18. Do not use if you are pregnant, or contemplating becoming pregnant, or nursing. Consult a medical doctor before using this product if you have been treated for, diagnosed with, or have a family history of any medical condition such as, but not limited to, high blood pressure, diabetes, cardiac conditions or taking any prescription drug or over-the-counter medication. Discontinue use two weeks prior to surgery. Use of this product may cause your skin to be extra sensitive to UV sources, such as artificial or natural sunlight. Avoid excessive exposure from these sources. Do not exceed the recommended dosage as improper use of this product will not improve results and is not advised. Use only as directed. Protect from heat, light and moisture. We have teamed up with molecular biologists, physicians, pharmacists, and herbalists to ensure our formula is sourced and produced by the best means possible. This is extremely important as herbs, vitamins, and natural compounds can be sourced through many places around the world and so choosing the right ones are factors to consider. There are many companies that manufacture dietary supplements – but who really knows what goes into these products? How do you know they are really using high quality ingredients? With Focus Fast® you can be assured that each bottle contains only the highest pure grade of quality ingredients. Manufactured in a state of the art facility that uses innovative-patented technologies, each formula contains a certificate of analysis proving that what you see on the label is in fact, in the product. Furthermore, our dedication to quality is an important factor, which is why the Focus Fast® formula is manufactured in a Food and Drug Administrated (FDA) inspected facility, which operates under the strict Good Manufacturing Practices (GMP); it is also independently approved by the National Sanitation Foundation (NFS) and certified by the Australian Therapeutic Goods Association (TGA). Finally, Focus Fast® is subject tova rious rigorous state-of-the-art scientific testing measures such as High Performance Liquid Chromatography (HPLC), which guarantees the utmost purity in your product. Focus Fast utilizes Neuro Focusing Technologies making it a special type of product called a Neuro Focusing Agent. It is also the World’s 1st & Only Neuro Focusing Agent® which is specifically designed to help you Improve Working Memory, Attention, and Focus – Fast! Typical focus pills or brain vitamins contain single or relatively few ingredients and do not activate all of the various physiological pathways that improve the storage and processing of information in the brain. Focus Fast utilizes All 6 Major Pathways! This is the essence of a Neuro Focusing Agent – utilizing all the various pathways to improve the storage and processing of information in the brain while being Fast and Efficient. 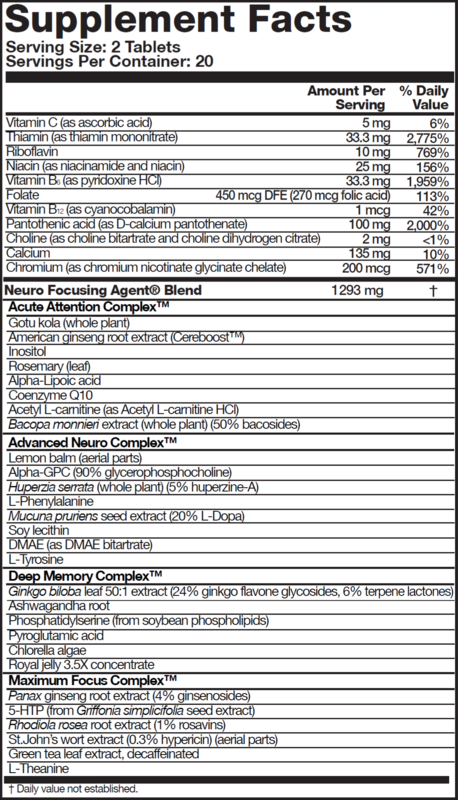 There are 39 scientifically engineered ingredients in 4 synergistic blends to ensure that your brain is functional and ready to tackle any tasks you have in mind! 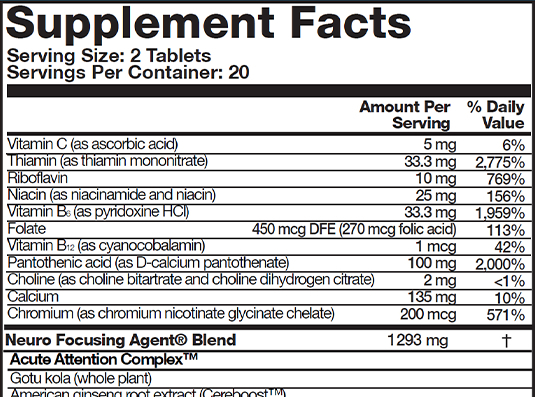 View the Supplement Facts. Why should I use Focus Fast? Manufactured in a state of the art facility that uses Innovative-patented Technologies. We are parterns with big name retailers such as GNC, Vitamin Shoppe and Amazon. This is something you will not see with other memory pills sold online. Focus Fast starts working immediately within 1 hour of dosing and actually increases in effect as much as 6 hours later. For optimal results, it should be used for at least four weeks. Research shows that the effects of the key ingredients continually increase with 12 weeks of use. Focus Fast works on a cellular level to Improve Working Memory, Enhance Attention, and Focus. Other memory pills or brain vitamins add caffeine to their products so that you “feel like the product is working”. It is stimulant free with specialized ingredients in precise ratios designed to increase your performance on cognitive activities. Some users report that they have been able to retain more information while at work and some have better memory recognition at school. Also, other users report that they are able to concentrate better on previously undesirable tasks as well as perform better on mental tasks such as chess, sudoku, and crosswords. Are there any artificial colors or sweeteners? Unlike other memory pills, Focus Fast® does not contain any artificial colours or sweeteners. Additionally, for maximum support, take 1 additional serving (2 tablets) with an 8 oz. glass of water approximately 30 minutes before lunch or mental activity, with a minimum of 4 hours apart from your first serving. I have ADHD - Can I take this? Focus Fast® has not been tested on individuals that have ADHD or ADHD symptoms. It is always best to consult a medical practioner for advice.